The smart moves the tech titan has made under CEO Tim Cook have led to riches for stockholders. Tim Cook became Apple's (NASDAQ:AAPL) CEO on Aug. 24, 2011, after Steve Jobs stepped down by telling the world, "I have always said if there ever came a day when I could no longer meet my duties and expectations as Apple's CEO, I would be the first to let you know. Unfortunately, that day has come." On that day -- if you adjust for the 7-for-1 stock split that the company announced in April 2014 -- Apple shares closed at $53.74. As of writing, the stock's most recent closing price was $225.03, more than quadruple what the shares were trading at the day Cook took the helm. The returns have been even sweeter if you factor in the dividends Apple has paid since then. Let's take a closer look at what has happened under Cook's tenure to help drive this enormous shareholder value creation. In the fiscal year that ended in September 2011, Apple generated $108.25 billion in revenue and $25.92 billion in net income -- both already enormous figures. By fiscal 2017, though, Apple's revenue had more than doubled to $229.2 billion. Net income wasn't too far behind, surging to more than $48 billion. Even better, Apple's current fiscal year -- that's fiscal 2018 -- is shaping up to be a record year for the company (Apple's previous records for revenue and net income actually happened during its 2015 fiscal year, when it generated nearly $234 billion in sales and about $53.4 billion in net income). The current analyst consensus calls for the company to rake in about $263.5 billion in sales and more than $62 billion in net income -- up about 15% and 21% from the prior fiscal year, respectively. Cook was handed a large, highly profitable business in 2011. Under his leadership, the company's revenue and profits have gotten much larger. Under Jobs, Apple didn't pay shareholders a dividend. However, on March 19, 2012, Apple put out a press release announcing its plans to "initiate a quarterly dividend of $2.65 per share sometime in the fourth quarter of its fiscal 2012, which begins on July 1, 2012." That quarterly dividend payment, adjusted for the 7-for-1 split, would be worth about $0.379 per share. Since then, Apple has steadily increased its quarterly dividend payouts. 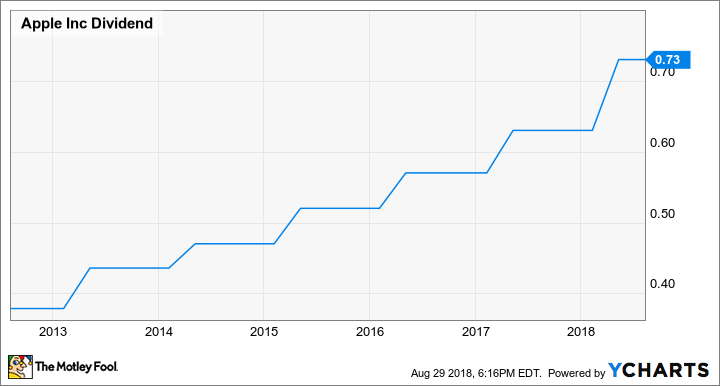 On July 31, Apple declared a $0.73/share quarterly dividend -- almost double what it was when the company first initiated a dividend in July 2012. Apple, Inc. Dividend, data by YCharts. Apple's capital return program hasn't been limited to dividend payments, either. In tandem with the first dividend announcement in March 2012, the tech titan also told shareholders that it would begin a stock repurchase program. That initial program was good for $10 billion of the company's stock and, according to Apple, had "the primary objective of neutralizing the impact of dilution from future employee equity grants and employee stock purchase programs." In other words, the goal of that initial buyback wasn't to dramatically shrink the company's share count, but instead to try to keep it from getting any larger. It wasn't long before Apple started getting far more aggressive with its capital return program. On April 23, 2013, Apple announced that its board "has increased its share repurchase authorization to $60 billion from the $10 billion level announced last year." A year later, Apple yet again boosted its share repurchase authorization to $90 billion. A year after that, Apple added another $50 billion to its share repurchase authorization, bringing the total authorization to $140 billion. Then, in April 2016, the company added another $35 billion to its share repurchase authorization, boosting the total authorization to $175 billion. Apple's board authorized yet another $35 billion of share repurchases in 2017. Most recently, Apple's board of directors "approved a new $100 billion share repurchase authorization" in May 2018. 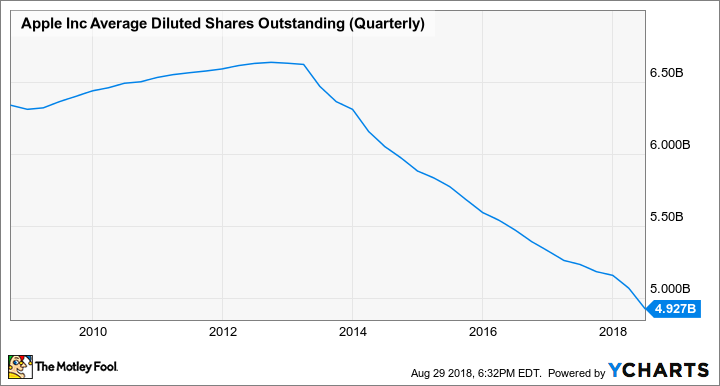 Apple's share repurchase program has dramatically reduced the company's share count, which has certainly helped to accelerate the company's earnings per share growth (since dividing a given level of net income by a smaller number of shares means more net income per share). Apple, Inc. Average Diluted Shares Outstanding (Quarterly), data by YCharts. Under Cook, Apple has launched many successful new products and services, which have manifested themselves in very fast growth for the company's Other Products and services segments, respectively. Some of the successful new product categories that have launched during his tenure include the Apple Watch (which is now the most successful smartwatch in the industry and sales of the product continue to grow at a rapid clip) as well as AirPods wireless earbuds. In aggregate, according to Cook, sales of the company's wearable products clocked in at over $10 billion between the fourth quarter of Apple's fiscal 2017 and the third quarter of the company's fiscal 2018. Perhaps even more impressive, though, has been the performance of the company's services business. For some perspective, Apple's iTunes, software, and services revenue was just $12.89 billion at the end of the company's fiscal 2012. By the end of fiscal 2017, that figure had risen to nearly $30 billion and, as my fellow Fool.com contributor Adam Levy points out, Apple is right on track to double its services revenue from fiscal 2016's level by 2020.